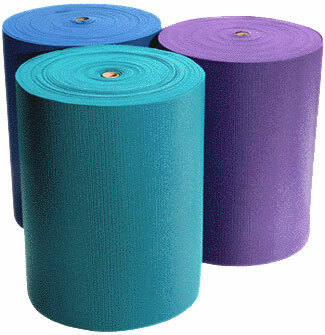 If you are a hands-on studio owner or just looking for a good investment, our ¼" Extra Thick Yoga Mat Roll is the answer! Truly the most economical way to furnish a yoga studio, gym, school, or fitness center! With our wholesale pricing, you will pay less than $8.25 per mat. Plus, these yoga mats are extra thick (a full quarter inch!) -- twice the size of our standard yoga mats. Each roll is 103 feet long (32m) by 24 inches wide and produces 18 standard length mats (68") or 17 extra long mats (72"). Our wide array of color choices are sure to match any yoga studio's decor. Make sure not to forget an easy-to-use rotary mat cutter and in no time, your yoga studio will be furnished! I love these extra thick mats in teal green. The color is rich and hides dirt. The material is the perfect thickness to protect joints on hard floors. These mats are great! I found my first yoga studio to teach at but they didn't have mats, stating most people prefer their own. I was in last minute need for a beginners mat for my students who were just beginning their practice and didn't yet have a mat, so ordered these. Shipping was fast, the material is nice and thick. I was able to get 18 standard mats out of it, can't beat it for the price! Thank you. We use the mats in our kennels to keep patients warm and have a soft bedding for them to lay. The roll was very worth the money. We cut to fit as needed and cleans very easily. Bought this to create pathways through our apartment on the wooden floors that were proving difficult for our old German Shepherd. She was slipping a lot, especially when turning around. She's much more comfortable and confident walking around on this surface. In Dec ‘17 my 135 lb dog became paralyzed at only 5 yrs old. The vertebrae in his neck rub against his spinal cord. He improved but still struggles to control his limbs. With wood floors, rugs just weren’t cutting it. When I found the yoga mat roll, I had to try it. The mats are amazing. I have them cut and laid as flooring around the whole downstairs. Cole has a new confidence in his ability to walk, which is improving his condition. This yoga mat roll has improved the quality of his life. I LOVE the quality of these mats. They are thick! My hands don't slip around on them while practicing either. I will say I had originally ordered the Hazelnut color thinking it would be that brownish gray color like in the photo, however it's plastic Barbie tan. The company was great to work with my disappointment in the color. I would reccomemd changing the sample photo listed, I think the color is misleading. Our company uses this to cover their repair benches, This helps prevent scratches and provide traction for the musical instruments they are repairing. It is easily cleanable and very durable. Highly recommended! This roll made just over 18 standard sized mats! Also, the quality is nice and thick! We planned on just using these as our rental mats at the studio, however we have people ask if they can purchase them all the time! We will definitely purchase again and again! Wonderful value. Mats are nice and thick for supporting knees, joints and backs. Got so many compliments from my clients about cushioning and they love the colour - Jasmine Green.